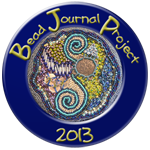 After beading a bead with peyote stitch the next stitch I had a go at was brick stitch. Dorothy Wood's book ' The Beader's Bible' has instructions how to make brick stitch rosettes. 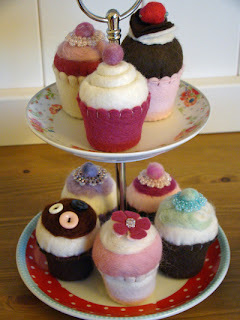 I started using a felt ball as the centre and used the rosettes to decorate some of my felt fairy cakes / cupcakes. This is the latest one with a Happy Birthday flag for a friend. Over the years I have made several felt fairy cakes. 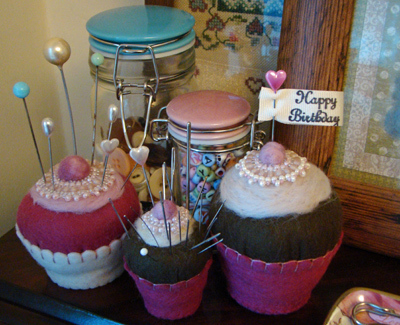 Some just as decoration, some as pincushions and some with message flags for friends. 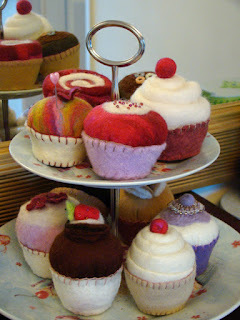 The cakes with the felt 'cherry' and beads are one of my favourites. The very first fairy cakes although slightly wonky fill a cake stand in the dining room. The later mini cupcakes are on a mini stand on the welsh dresser in the kitchen.